Disk images are a very useful way to store files for archival purposes--they keep all of your files in one place, and they take up only one entry in a folder listing, but they can be mounted like a separate hard drive with a double-click. They’re also relatively easy to create and use--easy, that is, if you’re used to working with the Disk Utility program that’s bundled with Mac OS X. If you’d prefer a simpler way to work with disk images, Click Archive is one such solution. Click Archive has an amazingly simple user interface--an (initially) blank translucent window. To create a disk image of a given folder, just drag and drop that folder onto the translucent window. The folder will then appear in the Click Archive window with a close button (to remove it), an information button (much like a Dashboard widget), and an Archive button. Click Archive lets you create reusable one-click buttons to create DMG files from folder. To set the options for the dropped folder’s disk image, click the information button; this will let you see the “back” of the dropped folder (again, like a Dashboard widget). On the back of the folder, you can specify the save location, encryption level, and password, and indicate whether you’d like to add some custom notes to this disk image. Click Done when things are set as you like, then click Archive to create the disk image. Once a folder has been through this process once, the date and time of the last disk image appear below the folder’s name in the Click Archive interface. The program retains your setup between runs, too, so once you’ve dragged in a handful of folders and set them up to your liking, you can create another disk image with a single mouse click. One thing you can’t do with Click Archive is combine folders from different parent folders into one archive. If you select two folders in the Finder and drop them on the Click Archive window, they’ll appear as two separate entries, and each will create its own disk image. There are only a few preferences in Click Archive: one to automatically check for updates, and another to add time stamps to disk image filenames. 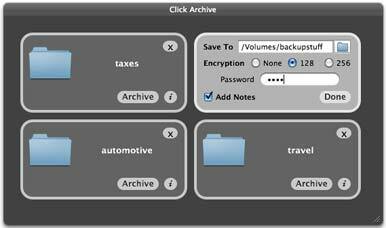 This makes it easy to use Click Archive as a simple backup tool for your critical files. While you won’t find many bells and whistles here--Disk Utility has many more options for working with disk images--what is here is well done, and the program couldn’t be much simpler to use. Want to stay up-to-date with the latest Gems? Sign up for the Mac Gems newsletter for a weekly e-mail summary of Gems reviews sent directly to your inbox. GemFest 2009 features great free and low-cost software for your Mac. If you’d prefer a simpler way to work with disk images, Click Archive is one such solution. This program aim taps into iPhoto's Faces feature so you can attach images to Address Book entries. GlimmerBlocker is an ad blocker that is safe to install because it doesn’t hack Safari. Wx is a meteorological program that is for anyone who’s serious about the weather. Digital Sentry is an aptly named program that monitors your computer for any of a number of events. DeskCover is a free program that adds a customizable background behind the icons on your desktop. VideoDrive aims to make video conversions easy. As a grand finale to GemFest 2009, here’s a list of some of our all-time favorite Mac Gems.